Free tools, guidelines, and activities to help you bring social and emotional learning to children in grades K-6 in your after-school setting. WINGS for Kids embeds social and emotional lessons in fun activities. 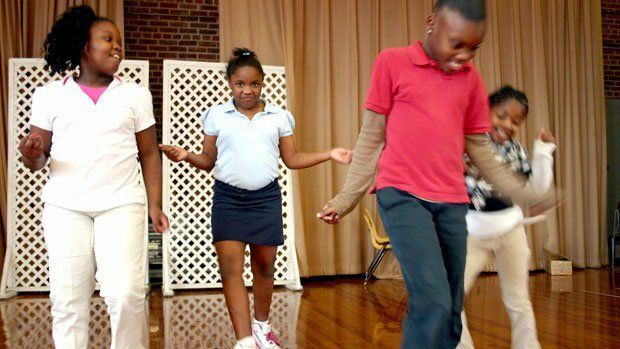 Fifth-grader Preona (from left), fourth-graders Shakayla and Jamara, and third-grader Tamarr take a step dancing class. WINGS serves kids who live in extreme poverty. In the schools where they currently operate:&#13; &#13; 97% of the students fall 185% below the federal poverty guidelines &#13; Approx. 90% of the children served come from single parent households&#13; 62% of the housing in their service area is rated as poor, deteriorated, or dilapidated&#13; 27% higher unemployment rate than the national average.